Please join us for our first annual Beech Street cleanup! We have partnered with Barrier Brewing to bring you an awesome day of helping the community while enjoying some local beer and winning some amazing raffle prizes (including a bike and surf lesson!). 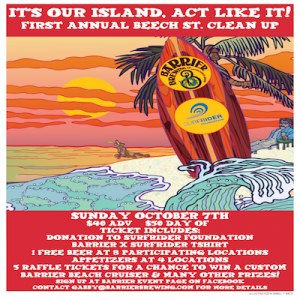 A portion of the ticket sales and all raffle sales will be donated to Surfrider Central LI! We will begin at 12pm at the Cabana (1034 Beech Street) where you can get registered, pickup your t-shirt, raffle ticket and cleaning supplies. We will head out to cleanup the mess left behind from the annual Irish Day festival and end at Danny Mac’s at New York Avenue. From there we will make a u-turn and enjoy a Barrier Brewing beer at 8 local bars and appetizers at 4 of them!